News in overnight from Bradford Marine Yacht Sales that Whit Kirtland has taken over the listing for sale of the 39.62 metre tri-deck motor yacht Charisma. Built in GRP by US yard Hatteras, Charisma was delivered in 1995 and had a full refit in 2007. The 2007 upgrades saw her interior completely restyled. Accommodation is for 10 guests in five cabins consisting of a full beam master suite on the main deck with a king sized bed and flat screen television while a further four cabins lie below. Three are doubles with queen sized beds and there is a twin, all with flat screen televisions and full en suite facilities. The aft deck dining area features a three piece large gloss teak dining table with seating for ten, including built in cushioned seating and six teak chairs. There is also a pop up flat screen television for both movies and satellite television. The saloon runs more than forty feet from the bar area aft to the dining area forward. The saloon and accommodation areas have joinery in gloss burl wood. There is storage with two wine storage coolers and storage for crystal, china, and silverware, and the counters are marble covered. A large L-shaped sofa on the port side offers seating for all guests, and faces the flat screen television that rises out of the burl wood cabinet on the starboard side. There are several seating areas, and a desk to port, complete with a computer. Charisma has V-SAT 24/7 internet access, available in WiFi throughout the yacht. The entertainment areas feature two DVD players, a 5-disc CD player, tuner and eight speakers throughout the saloon and aft deck. All equipment is operated by a single remote control. Twin 2,446hp Detroit Diesel engines give her a cruising speed of 18 knots. 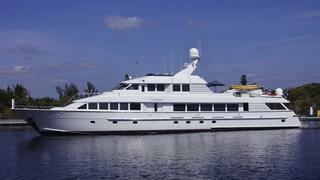 Lying in Fort Lauderdale, Florida, Charisma is asking $2,795,000.